Editor’s note: An earlier version of this story misstated the price of each cabin. The information came from the Associated Press. The state would have the option to purchase each cabin at a price of $4,500 after six years, according to a state parks spokesman. The story has been updated to reflect the accurate information. An Arizona legislative committee has backed a planned $6.4 million redevelopment of Cattail Cove State Park, as well as millions more dollars toward parks throughout the state to improve amenities at state campgrounds. The funding may mark the reversal of a downward trend in budget cuts to the State Parks agency since 2012, according to records from the Arizona Budget Appropriations Committee. Four years ago, State Parks operated with a budget of about $96 million. By 2016, that budget had been slashed by more than $60 million, according to budget records. The state also will fund $2.5 million in projects at five other parks to fund expansion and improvements to existing state parks such as Buckskin Mountain State Park near Parker and Alamo State Park in La Paz County. 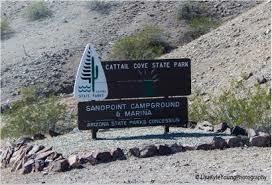 The state also recently announced it was planning a new state park near Contact Point. Borrelli believes the renovations will have a positive impact on the Havasu region’s economy as state lands see improvements and upgrades over the next several years. Proposed renovations to Sandpoint Marina and Cattail Cove have lain dormant for years, Borrelli said, and completing those renovations will bolster tourism and economic development for the Havasu region. Lake Havasu Marine Association CEO Jim Salscheider says potential development of Cattail Cove and Sandpoint Marina would make Havasu’s future much brighter. Sandpoint Marina was once a popular destination for RV motorists, but was closed in 2015 when State Parks chose not to renew the operators’ lease over the land. Through the deal, six of Arizona’s state parks will have the option of purchasing 100 cabins from an undisclosed vendor, at a cost of $4,500 per cabin after six years, and then receive 100 percent of rental revenue, according to the Associated Press. The state currently maintains 28 cabins at Roper Lake, Alamo Lake, Dead Horse Ranch and Lyman Lake State Parks. The rate of occupancy for each of those cabins is about 50 percent this year, and State Parks officials believe there is a market for more of them throughout Arizona.